Media personality and former champion swimmer Johanna Griggs has joined the board of depression Not for Profit beyondbue. 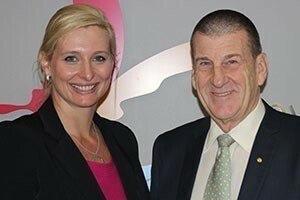 New beyondblue board member Johanna Griggs and Chair Jeff Kennett. According to the beyondblue Chairman Jeff Kennett, Griggs’s appointment continues the Board’s desire to refresh its membership and broaden the experience and skills of its Directors. He said beyondblue’s Board comprised of individuals with medical backgrounds and lay people with a range of living experiences who add to the quality of the organisation’s campaigns and programs. “Johanna more than qualifies for this role,” he said. “As a former elite athlete, Johanna is driven, passionate and committed to everything in which she is involved, which will now include beyondblue. Griggs, a former champion swimmer who won a backstroke bronze medal for Australia at the 1990 Auckland Commonwealth Games and a silver at the 1991 World Championships, is most recognised for her television work on programs such as Better Homes and Gardens, House Rules and the coverage of the Olympic Games. “I am determined to work towards an Australia that better understands and deals with these conditions, where stigma is reduced and where people experiencing depression and anxiety get the support they need,” Griggs said.